As the venue will be in lock down for the 2019 Formula 1® Rolex Australian Grand Prix, it is a mandatory requirement that all guests bring their ticket to the event. Below is some information on how to get to the venue, please be aware that there is no on-site parking available. Victoria has range of public transport options available. Public Transport Victoria‘s journey planner will help you find routes and timetables. V/Line provides information about regional public transport and includes interstate journeys. International and interstate visitors coming to Victoria can buy a myki Visitor Value Pack to travel on Melbourne’s public transport network. 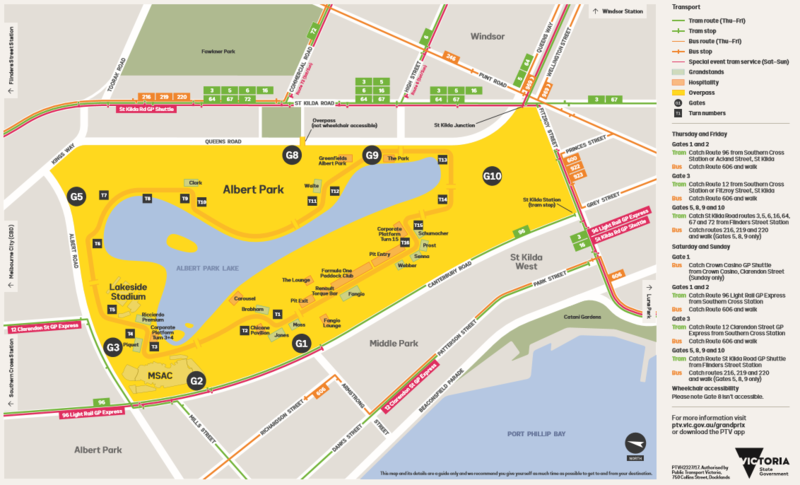 Event shuttles will run from Gate 1 to the Venue within Albert Park between 11.30am and 12.15pm. Shuttles will run again at the end of the event to return guests to Gate 1.